Just ran speed tests for cable modem connection and mobile broadband (LTE). At 23.1 Mb/s cable modem download is slightly faster (by 0.9 Mb/s or 4.2%). However mobile broadband does significantly better than cable modem in upload speed at 8.81 Mb/s (4.1 Mb/s better or 83%). 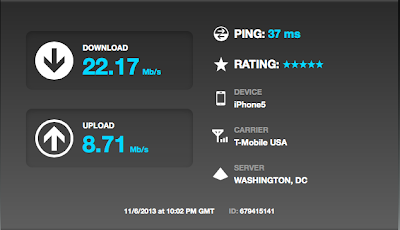 Ping is much faster on cable modem at 12 ms (more than 3 times faster). Results below.